Frost King s Plastic sheeting allows you to create a protective sheet of any length. 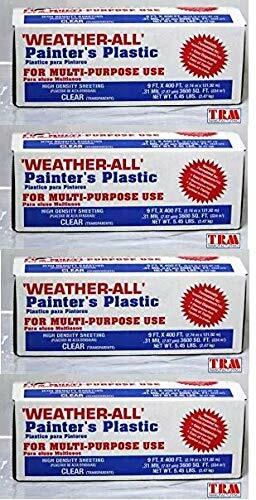 Great for painting, storage, covering appliances and any other applications in need of cover. Cleaning Solutions 79052 Drop Cloth, Beige is manufactured with premium quality canvas and measures a generous 6' x 9'. 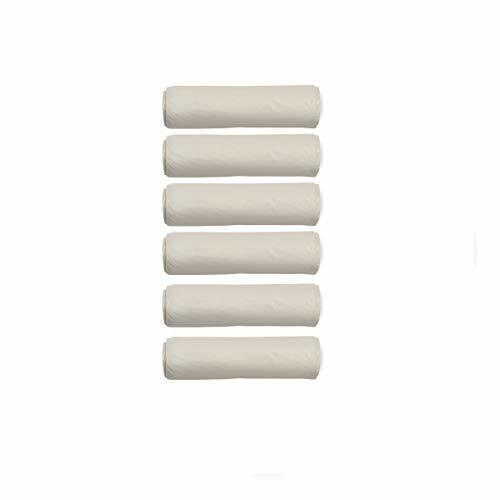 Excellent for use in painting, cleaning, wallpapering and removal, it's imported, and manufactured with premium quality material to be heavy weight and durable. 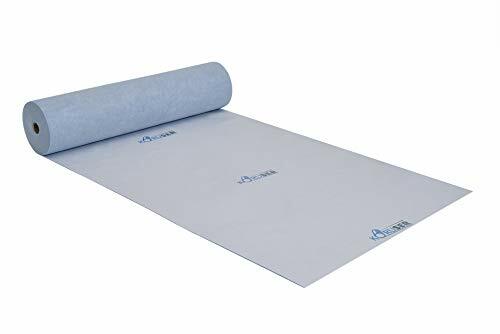 The washable and reusable canvas lends itself to be a perfect option for use as temporary floor covering; providing high quality protection for your floors, furniture, carpets and other belongings requiring cover throughout your projects. BREAKTHROUGH! 6 x 9 Finished Size ensures that you can cover, protect, and create exactly what you need - Easy. DEPENDABLE! New Unmarked Durable Material leaves you worry-free about receiving a tarp with someone else's markings all over it - Absolutely Beautiful. FAST RESULTS! Completely Odorless so you can use it immediately, no pre-washing or gas mask required - Saves Time. UNMATCHED PERFORMANCE! 100% Cotton Duck Tarps (6oz) give you the power to be creative anywhere because they are beautiful enough for the indoors and tough enough for the outdoors - Effortless. BREAKTHROUGH! 9 x 12 Finished Size ensures that you can cover, protect, and create exactly what you need - Easy. 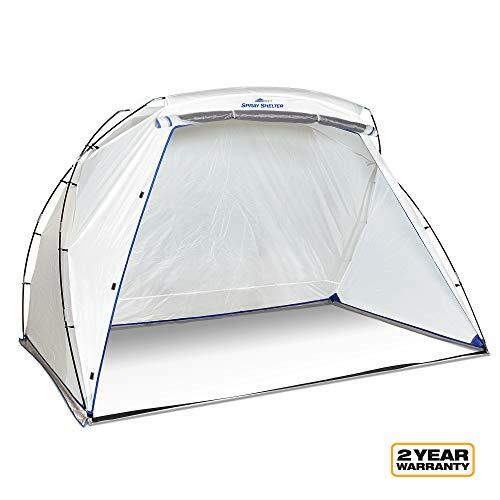 In just a few simple steps, the Spray Shelter can be set up in your working area. That means there s more time for painting! At TapeManBlue, we know you can't afford to damage your carpets during construction and renovation. We also know that you're tired of the hassle of drop cloths, plastic tarps, and carpet protection tapes that simply just don't stick. That's why we provide an American made carpet protection film that far surpasses the quality of the other products on the market. 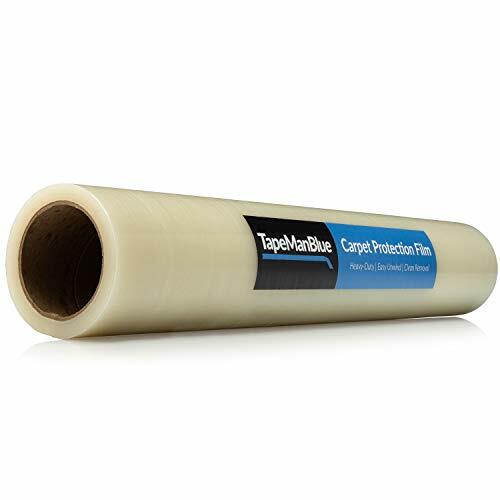 TapeManBlue 24" x 200' Carpet Protection Film is a polyethelene film coated with removable adhesive. It sticks edge to edge, allowing the product to stay in place and eliminating the creases and tripping hazards that are so typical of competitive products. While it has the grab necessary to get the job done, it can be cleanly removed for up to 45 days without damaging your rug. The material is highly resistant to tearing and puncturing from sharp items such as tools or high heel shoes. Professionals use TapeManBlue Carpet Protection Film for various applications, including: Construction, remodeling, renovation, restoration, painting, maintenance, model homes & vehicles, showrooms, open houses, parties, RVs, and much more This carpet protection film is designed for use on synthetic carpeting, not for use on natural fibers or other flooring. It should not be used on freshly cleaned carpet. ULTIMATE PROTECTION: Protects against dirt, dust, foot traffic, paint spills, construction debris, and a wide variety of other messes! EASY INSTALLATION: The reverse-wound roll makes it simple and easy to install the product to protect your surface. 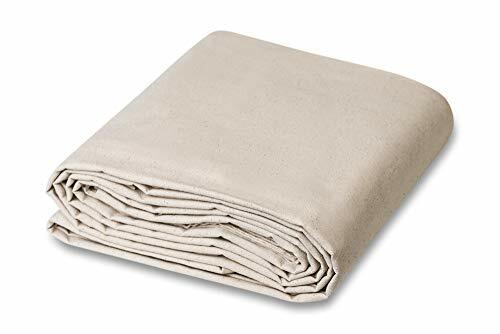 This 10oz Heavyweight Canvas drop cloth from Trimaco is ideal for a variety of jobs that need extra absorbent protection. Painting, cleaning, DIY or craft project - this thick drop cloth will meet your needs. The drop cloth is one full piece without seams. Made from tightly woven duck or twill material, similar to the thickness of jeans, to reduce leakage during your paint project. Absorbent canvas reduces paint tracking on the job and absorbs spills and splatters. This drop cloth is washable, reusable and durable. Have a small project? 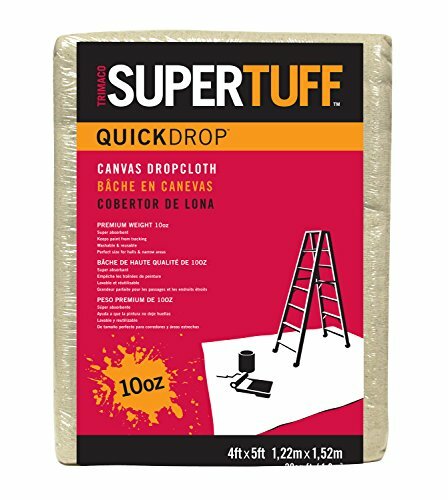 Whether you re a professional painter, DIY enthusiast, or feeling crafty Trimaco s SuperTuff Quick Drop canvas drop cloth will be your new best friend. No need for a bulky drop cloth. Simply unfold and get to work. When you re finished this drop cloth can be thrown in the wash and stored away for your next use. From curtains to painting, Trimaco s drop cloth has you covered. 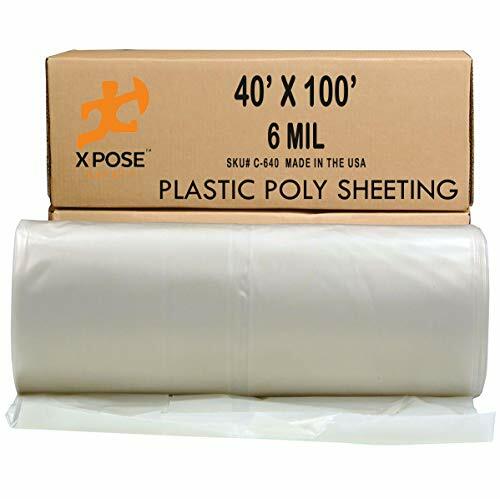 Husky RS403-50C 3' X 50' 4 Millimeter Opaque Plastic Sheeting All purpose plastic sheeting Great for weatherproofing, landscaping, construction and remodeling 4 millimeter thickness Opaque 3' x 50'. This Product is manufactured in United States. 4' x 12' canvas drop cloth is made to handle any paint or heavy duty home improvement project. 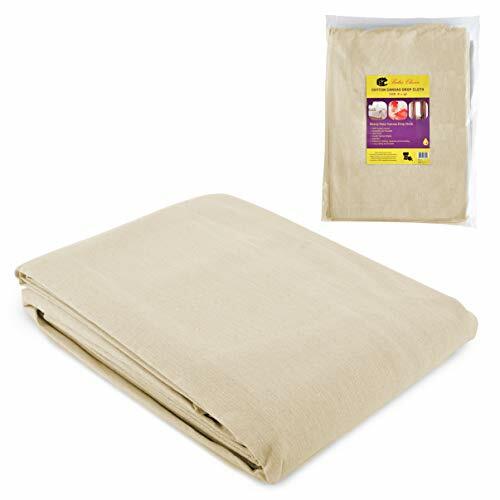 Made from 100% cotton duck canvas fabric, this will protects floors, carpets, furniture or equipment, absorb paint spills, traps dust, and debris for faster clean-up. 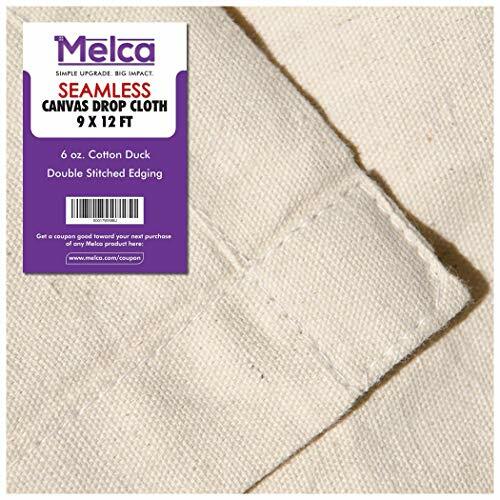 With double-stitched seams and heavy-duty rot-resistant thread, this canvas drop cloth is washable and reusable. 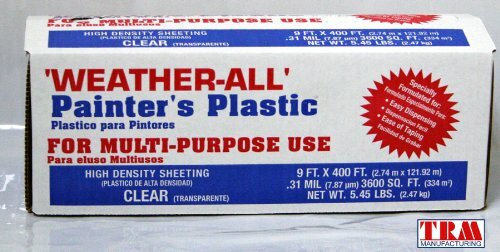 Great for curtains, DIY projects, painting and more. Simpli-Magic 79070 Canvas Drop Cloth (Size: 9 x 12 ) Ideal for All Purpose Use is made to handle any paint or heavy duty home improvement project. 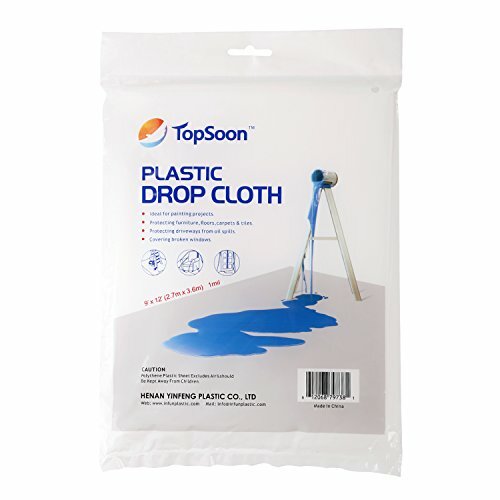 Made from a cotton/poly blended canvas fabric, this Drop Cloth will protect floors, carpets, furniture, and equipment. It will absorb paint spills, trap dust, and debris for faster clean-up. 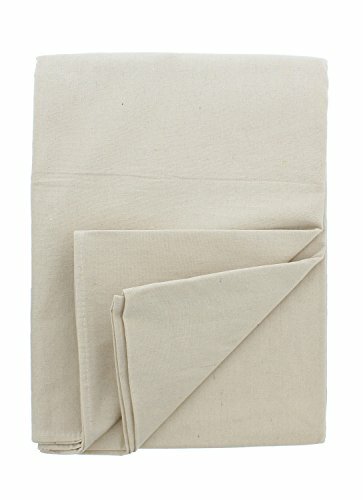 Made with heavy-duty rot-resistant thread, this canvas drop cloth is washable and reusable. Can be used to make Curtains and other home decoration coverings. Guaranteed Genuine 3M Scotchgard Clear Bra Paint Protection Film or your money back! Brand new, in stock & ready to ship! 3M Scotchgard surface protection film is virtually invisible once installed. Clear polyurethane film is 8mil thick with adhesive backing. Keeps your car's paint looking newer, longer. Step by step installation instructions available online. Working on a messy project that you are worried will ruin your floors or furniture? The ABN | Painters Canvas Cotton Fabric Drop Cloth 6 by 9 Foot Large Drop Cloth handles paints, stains, and home improvement projects easily. Poly-cotton blend canvas painters drop cloth features seamed edges that will not fray, tear, or break down during use. These medium weight drop cloths are machine washable and able to stand multiple uses. Use this cloth to protect your indoor and outdoor floors and furniture or use to craft drapes, rugs, and table cloths. Each package includes (1) ABN medium 6-foot x 9-foot (1.8m x 2.7m) canvas drop cloth to suit your application. Advances in plastic technology continue to open new doors both in equipment and in raw materials. Taking advantage of the latest advances in the polymer sciences, TRM Manufacturing is adding a new items to its family of products which will have great demand in the paint, plaster and related industries. The feature of this new product is a combination of light gauge ,unusual toughness of material, ease of opening folded rolls , consistent ability of masking tape to adhere to product. Bates Choice Drop Cloth Is Designed To Be Used For Craft Projects, DIY And Painting Jobs To Cover Floors And Furniture. Warranty: If, For Any Reason, You Are Not Happy With Your Purchase, We Will Refund Or Replace Your Drop Cloth. PROTECT YOUR ITEMS IN STORAGE - Tapix Plastic Drop Cloth makes sure your item in storage maintains it's brand new look. Ideal for any size objects from small, medium to large and any shape. KEEP YOUR ITEMS DRY - Cover your precious paintings when moving or when in storage to avoid from getting wet and from smudging. It's translucent feature will help your see through your items quickly. PROTECT YOUR FLOOR FROM PAINT - Use the Tapix Plastic Drop Cloth when painting your walls. Keep the paint splatters from getting to your floor and never worry about cleaning up after the task. 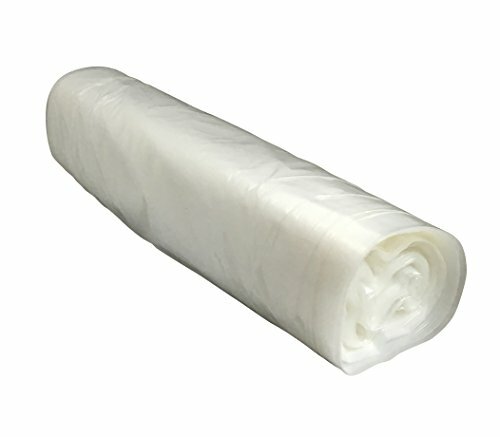 DISPOSABLE - Each purchase of the Tapix Plastic Drop Cloth comes in a convenient 3-Roll pack and 108 sq ft in parameter. Great buy and can be used in so many ways possible. Tapix Brand is known worldwide with superior product quality and service! 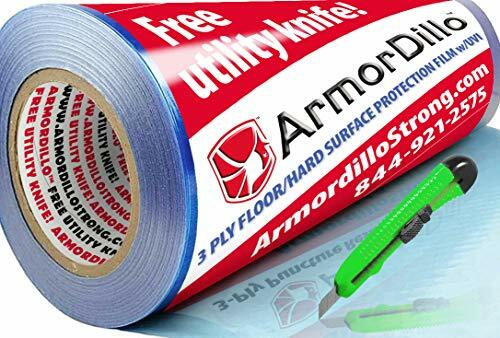 Completely made in America - ArmorDillo Removable Hardwood and Hard Surface Paint Protection Film is a med-tack surface protection film and clear protective film with a blue tint used for temporary floor protection and temporary floor covering. Easy to Apply! Easy Clean Up! Repositionable, leaves no residue! Thinner but stronger than 3mil. Our Proprietary Linear low 2.2mil construction keeps film light, much easier to use, but stronger than 3mils and most 4 mils on the market today! (Think plate of steel vs plywood). This plastic protection film is durable and self-adhering. 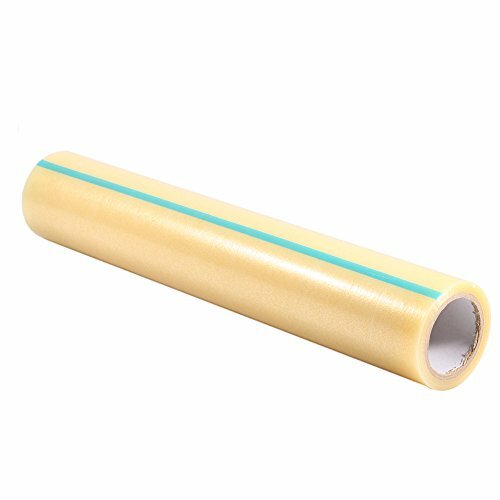 Use this blue - clear adhesive film for all types of hard surfaces and other surfaces that call for med tack with removable adhesive protection such as furniture, countertops, laminate, hardwood, metal etc...as a clear protective film, multi surface protection film, paint protection film, moving floor protection, protective tape and temporary floor protection and covering. Ideal for remodeling, painting, moving, model home tours, parties, construction, car and home upholstery pet protection and more. Heavy linear-low construction with removable adhesive. Lasts 45 to 60 days. Easy on and off, designed to leave no residue. High rubber content makes it puncture-resistant. No VOCs. Meets LEEDs requirements. MADE COMPLETELY IN THE USA! OTHER USES: paint protection film, protective floor covering, surface protective film, clear paint protection, protective plastic film, protective tape, paint protection tape, scotchguard paint protection, self adhesive carpet protector, paint protection, adhesive film, polyethylene film, sticky plastic parts protector and more! Why Pay More? Brand: ArmorDillo | Manufacturer: A.D. RESTRICTIONS: ! NOT FOR PLUSH / THICK / NATURAL CARPETS ! 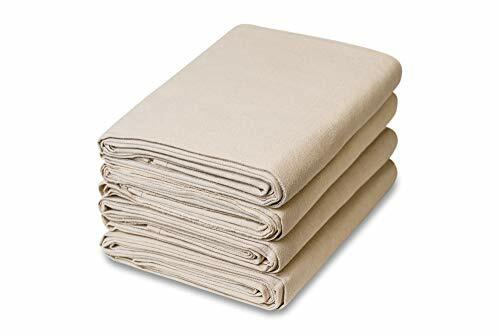 4' x 15' canvas drop cloths are made to handle any paint or heavy duty home improvement project. 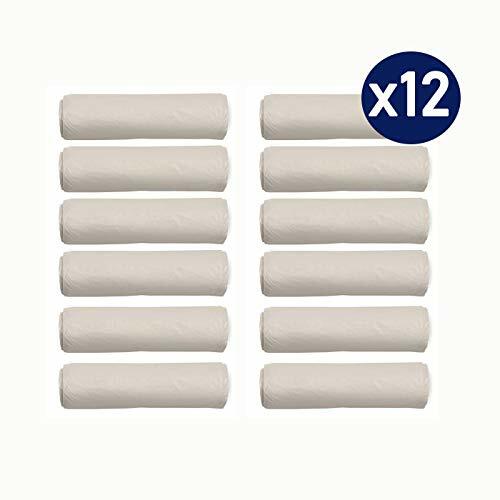 Made from 100% cotton duck canvas fabric, this will protects floors, carpets, furniture or equipment, absorb paint spills, traps dust, and debris for faster clean-up. 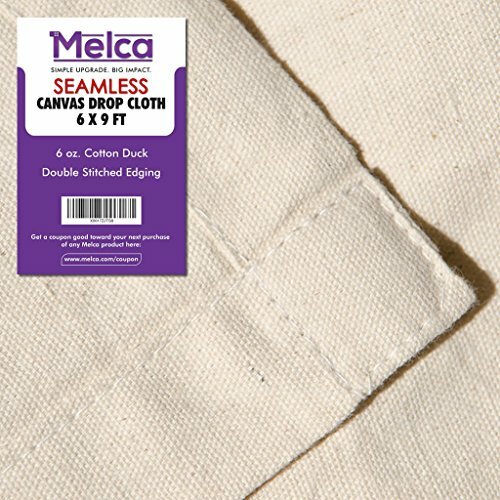 With double-stitched seams and heavy-duty rot-resistant thread, this canvas drop cloth is washable and reusable. Trimaco's ClingCover Plastic Sheeting will cling to almost any surface and is the perfect self-adhering masking film for all your painting, sanding and remodeling jobs. Our premium film is treated with a unique formula that not only attracts overspray, but reduces flaking as well. Made to withstand multiple uses without making a mess, ClingCover makes painting easier, cleaner and faster. 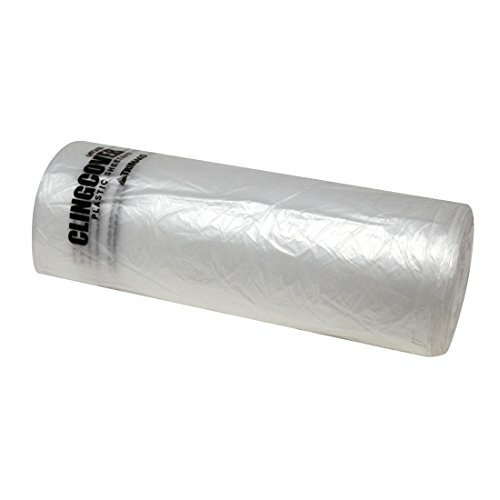 ClingCover clings and protects walls and almost any surface it comes in contact with. This premium film is treated with a unique formula that not only attracts overspray and dust, but reduces flaking as well. Aluf Plastics, Poly Sheeting, 20' x 100', 6 Mil Extra strong, Clear, All Purpose, Great for Painting, Decorating, Renovation Projects, will protect from Dust, Dirt and Moisture. This Carpet Protector provides protection against decorating spills, high foot traffic when moving house and is suitable for stair carpets. Simple and fast installation and removal. It must be renewed every four weeks (not suitable for thick pile carpets). Suitable For Cut Pile Carpet. 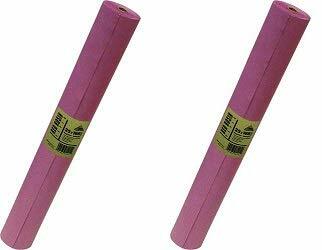 Size: (Width) 60cm x (Long) 100m Roll. [Best Quality] --- High Performance Puncture And Tear Resistant. Low tack, adhesive carpet protector film, made of tough polythene and designed to protect carpets without creating a trip hazard. [Decor Protection] --- Ideal To Protect Your Carpets Against Decorating Spills. Self-Adhesive, Temporary Protection For All Carpeted Areas, Including Stairs. [No Mark] --- Easy Applying And Removal Without Any Residue Or Mark. Avoid Stretching And Apply To Clean & Dry Carpet. [Cost Saving] --- Saves Expensive Clean-up Costs And Acts As Carpet Cover. Much Safer Than Dust Sheets For Professionals. [Wide Application] --- Suitable For Cut Pile Carpet. Great For Both Rooms, Staircases And Corridors. The superior moisture barrier of this Red Rosin Paper makes it very useful for flooring and roofing projects. Temporary Floor Protection 36 x 100 - Anti Slip, Easily Applied Save Your Time - 100% Paint Proof Reusable Material, Forget About Damages During Heavy-Duty. Coverage of 300 sqft! SAFE USE & ANTI-SLIP : Koruser is a product which can be easily spread overall ground surfaces such as wood or marbel and it enables secure working environment through its sure-footed feature.Prevents all kinds of accidents ! EASILY APPLIED : All surfaces such as stairs, corners, frames, baseboards and other surfaces which are difficult to apply. No tape required ! PAINT PROOF : As there is a lm covering on the top of the Koruser product, it is paint and liquid proof. It keeps the paint and the liquid on the surface. It is easily cleaned and you can reuse it.In addition , protects the floor from any damage ! PREVENTS MO STURE , BREATHABLE: Due to its breathable structure Koruser vaporizes the remaining moisture on the ground and eliminates it. SAVE YOUR MONEY : After Koruser is used its surface is cleaned, it is folded and stored for reuse.In addition you will not spend money for tapes and no labor required. 6 Stair protection per pack with 10"-11" in depth Introducing the industy's first paperboard stair protection product. 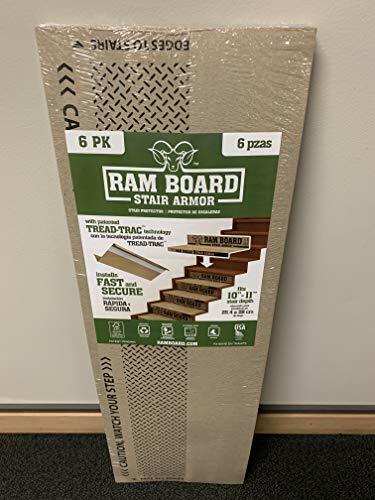 Made with heavy-duty Ram Board, adjustable tread sizing, bull-nose protection, and Spill Guard Technology, Stair Armor is the absolute end-all of stair protection.